Traditionally throught to be the best tasting carrots, Chantenay carrots are stump-rooted, early maincrop types with small cored orange roots of fine texture. Row 15m (50'). For early crops sow Amsterdam Forcing or Rocket in frames or under cloches February-March. Start outdoor sowings from early March choosing a warm and well-drained position. For maincrop, sow April-July. Sow into a fine tilth of crumbly earth. Sow seed 1.8cm (¾") deep in drills 23-30cm (9-12") apart. Thin seedlings when the first rough leaves appear, repeating as necessary until plants are 5-7.5cm (2-3") apart. Row 6m (20') or more. 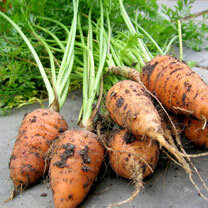 Sow thinly to minimise thinning (which can attract Carrot Root Fly). The carrot is a storage organ and hence shop bought produce can be high in pesticide residues - so a good reason to grow your own. HEALTH BENEFITS: Very high in vitamin A (For growth, healthy hair, skin, bones, teeth and eyes as well as resistance to respiratory infections). COOKING HINTS: Unlike many vegetables, the availability of nutrients is actually increased with cooking - as long as not overdone.